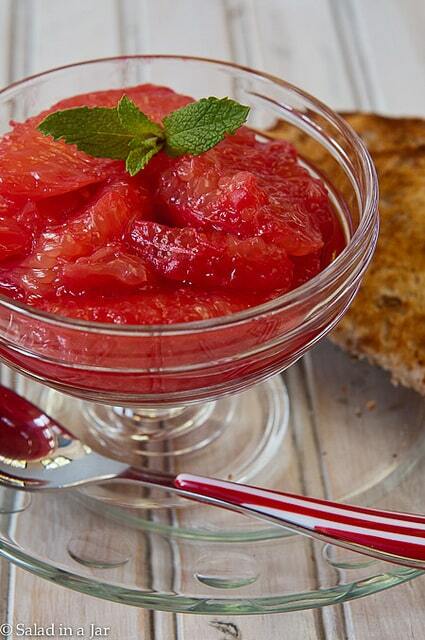 Raspberry-Marinated Grapefruit is simple but beautiful fruit compote composed of grapefruit marinated in a raspberry puree. There’s no recipe. Just follow the pictures below. Grapefruit is my new dessert. I like it plain or fancy, served as wedges or just cut in half. But occasionally, I crave grapefruit wedges soaked in raspberry puree. This is a particularly good way to serve grapefruit to company because it not only looks festive but can be prepared ahead of time, and really, it should be for maximum raspberry flavor. It’s also easier to eat compared to digging each wedge out with a grapefruit spoon, although I enjoy that, too, for routine grapefruit eating. It adds a certain element of satisfaction and enjoyment not unlike eating corn off the cob or picking every last morsel of meat and crunch from a piece of fried chicken. No recipe here. Just follow along and adjust the amounts to your needs. 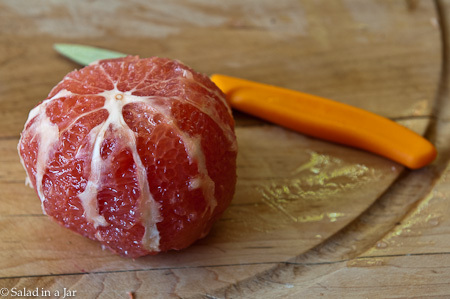 Remove the outer peel from a whole grapefruit. Peel one grapefruit for every two people you are serving. If I’m invited, better allow a whole grapefruit for me. 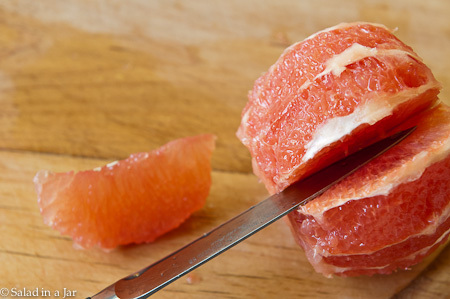 Remove whole wedges of grapefruit by slipping a sharp knife inside the membrane of each section. The process of extracting wedges can be time-consuming until you get the hang of it. Then it will go fast. Or you can buy the prepared wedges in the refrigerated section of your grocery store. 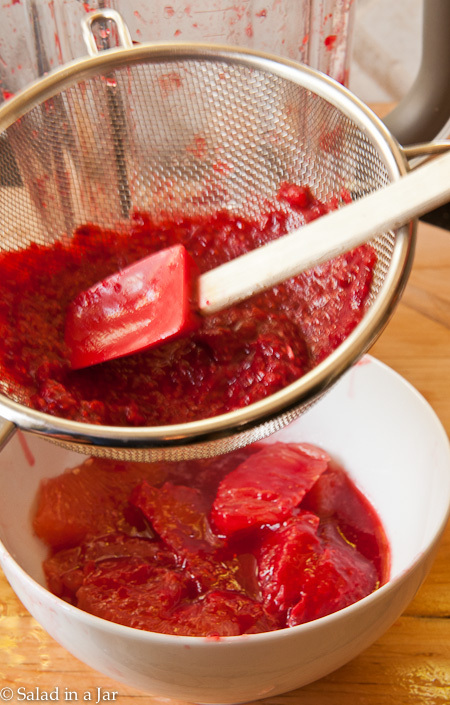 Push fresh or defrosted raspberries through a strainer to remove seeds. Pureeing first (that’s the blender in the background of this picture) makes the process easier, but is not absolutely necessary. Use enough fresh or frozen raspberries to barely cover the grapefruit. Does the tartness of grapefruit offend your sweet tooth? Add a spoonful of sugar, honey or sweetener. If there is a lime in the house, I like to add a couple squeezes just for fun. Refrigerate overnight. Is this too simple? I hope you’ll forgive me. Thanks to Helen Corbitt for this idea she called “Grapefruit Melba”. I love having fruit like this in salads. This might sound weird, but try pinching a tiny bit of Maldon salt over grapefruit sometime. It’s incredible how the subtle salt wakes up the sweet flavors. I adore everything grapefruit, so I am sure I would love this. Thanks for such a simple, delicious idea that is waist friendly too. Grapefruit makes involuntary facial puckers on me and I have a really hard time with it. I LOVE raspberries so perhaps a marriage of the two with some additional sweetener might be just what I need. The serving in the dessert dish sure looks delicious! And it does pack a big vitamin punch! This is so pretty Paula, I think I would love it spooned over Greek yogurt!